The new year is here and commitment is everywhere. We commit to something every day in many different ways. From driving the same route to work each morning, becoming non-commissioned ambassadors to our favorite brands, signing a new two-year agreement for savings on the latest Apple device or committing to finding love by exchanging contact info following an exciting conversation at happy hour. Commitment is always priority…until it comes to ourselves. Do me a favor – take a pen and paper, write down your goals from last year and draw line through the ones that were accomplished. Commitment by definition is, “the state or quality of being dedicated to a cause, activity, etc.” I would like for you to highlight these three words: state, dedicated and cause. Our mental state has to remain positive; this is the foundation that helps us build. While striving to make progress, we must be dedicated to a purpose and cause. This sense of dedication gives us the strength to get after it time and time again! If you’re ever in an idle state of mind, just remember your standards – the standards that you live by – to keep you dedicated to your cause. These are values that can’t change, even when our surroundings seem to change by the second. When we want to make excuses and become complacent, we should remind ourselves that we have to be proud of the reflection in the mirror. Often times, we forget that our current state isn’t our past and definitely isn’t our future. We should always be thankful for our past, while remaining hopeful for our future. Ultimately, our mindset weighs our opinion one way or the other. The mirror should serve as a reflection of motivation, not an image of what we will be forever. Whatever is your passion, whatever serves as the fire to your flame, let that be your driving force, but you must first commit to the person that it all starts with – YOURSELF! Do you have goal setting plans for the year ahead? Share your thoughts in the comment section below! 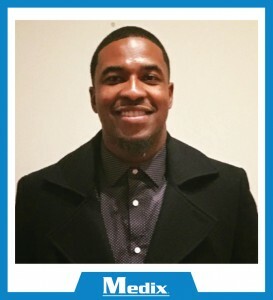 Guest author Torey Brown is a Recruitment Advisor in Medix’s Houston office. Well said Torey Brown. When you put yourself first everything else will fall into the right places and perspectives. I enjoyed reading this. Keep up the good work! This surely was a good piece of reading material. Very well written Torey! We do often forget about ourselves as we get caught up in the work and world around us. One way that I commit to myself, is by staying active and taking care of the body I have been given. Crossfit is my workout program of choice and by eating healthy and getting massages occasionally I am able to remain strong and ready to tackle the crazy world around me!